Nothing can be lonelier than being away from family and friends during the Christmas season. This was especially true of those who left the sanctuary of their eastern homes to settle in the remote territory of Oklahoma in the nineteenth century. 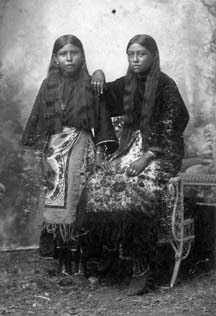 Like many of the people who immigrated to the American West, pioneers who settled in Oklahoma and Indian Territory (Twin Territories) brought with them cultural traditions long practiced in the communities they left behind. But, the frontier environment often altered many of the ways in which pioneers observed the holidays. In their new communities, families came together to celebrate their first Christmases by sharing traditions and inventing new practices, which created many of the Christmas customs we enjoy in Oklahoma today. Some of the first Christmas celebrations recorded in Oklahoma were among members of the Five Civilized Tribes in Indian Territory. Before the federal government forcibly removed the Cherokees, Chickasaws, Choctaws, Creeks and Seminoles from their eastern homelands in the 1830s, missionaries worked among the tribes to convert them to Christianity. After settlement in Indian Territory of present-day eastern Oklahoma, missionary continued working to build missions and schools to serve the Native people. Henry Wilson, was one of many missionaries sent to Indian Territory by the Presbyterian Missionary Board. Wilson arrived at Dwight Mission on a cold December evening of 1832. After the long journey, he was delighted when he heard the mission bells ringing as he approached. 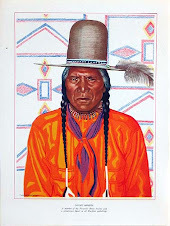 His traveling companions told him that the bells were calling the converted Cherokees to service and that they were preparing for the Christmas celebration. During Wilson’s long journey to Indian Territory, he had wondered what Christmas would be like in the West. He understood that when he left his family in Connecticut he was also leaving many of his familiar traditions. In order to facilitate Indian Settlement in the nineteenth century, the United States government constructed forts and stationed troops in Indian Territory. Government agents and mission workers who lived among the different Plains Tribes in western Oklahoma also introduced Christmas and holiday customs of nineteenth-century America to the Native people. Along with teaching the religious significance of Christmas, missionaries introduced the practice of gift giving and special holiday feast to the Native people. 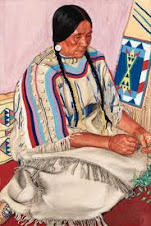 Also in Oklahoma Territory, the Federal government established Indian Agencies, where they employed Field Matrons to teach Indian women sewing and cooking and to assist with nutrition and health issues. At Rainy Mountain Mission on the Kiowa Reservation near Fort Sill in Southwestern Oklahoma, Lauretta Ballew, field matron, was responsible for planning the Christmas celebration among the Kiowa. In 1896, she worked for days decorating the Christmas tree, which had a prominent position in Immanuel Chapel at the Mission. From the charitable donations of eastern associations, Ballew was able to gather 380 presents for parents and children, which she placed under the tree. On Christmas Eve, Kiowa families filled the chapel to capacity, and one by one each received a gift. There was also two large barrels near the tree, both filled to the top with bags of candy, a bag for every person at the service. By the turn of the twentieth century, more and more Native children were attending Indian schools, where part of the curriculum included preparing for Christmas programs. The curriculum at the Chilocco Indian School in northern Oklahoma Territory offered boys and girls courses that gave them the skills to function in society. Preparing for Christmas was one of the ways in which the students could use skills learned in class. 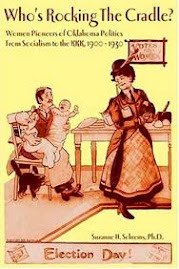 In 1905, the children prepared for their Christmas program entitled, “ A Christmas Crusade, or Santa Claus in the Klondike Gold Regions.” The boys built the set for the program in carpentry class, and some of the girls made the costumes for the pageant in their sewing classes, while others prepared refreshments for the holiday in their cooking classes. The Christmas celebration started with a performance by the student orchestra. On Christmas Eve, various homes on the grounds of the school decorated Christmas trees and Santa visited each home. On Christmas day the celebration started with Sunday school. At noon all sat down to a large Christmas dinner, and in the afternoon all enjoyed a public band concert. The celebration concluded the next day with a dress parade in the morning and football game in the afternoon. 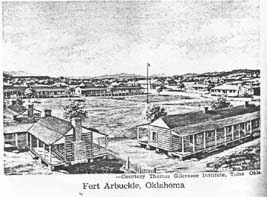 When the federal government opened Oklahoma Territory to settlement with the land run on April 22, 1889, the rush of new residents created instant communities. But, those first years in a new country were lonely ones, especially during the Christmas holidays when families missed their loved ones. Ino Lee Robinson remembered, “It was in April, 1891, that my mother with three small children left her native home in Leavenworth County Kansas and came to Oklahoma to join father. 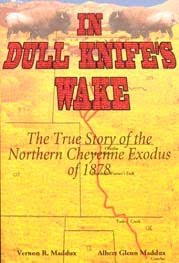 He had come two months before and bought a claim twelve miles southwest of Guthrie. It is needless to say that mother rather reluctantly left her relatives and friends to enter a new life in a strange and new land. Fourth of July and Christmas were the happy times of the year. We always attended a Fourth of July celebration at some picnic grove. 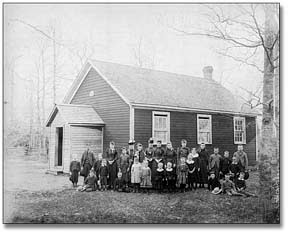 At Christmas time we had a Christmas tree at the schoolhouse. Coming together as a community to celebrate Christmas was a new tradition where friends and neighbors took the place of family. The celebrations usually took place in the local school or church. The planning began weeks in advance with the organization of committees to locate and chop down the tree, to decorate the tree, to prepare the Christmas program, to find someone to play Santa Claus and distribute gifts, and to coordinate the community Christmas dinner. 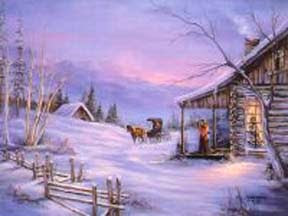 In this way, community celebrations, especially Christmas, helped new settlers to adjust to their homes away from home. Finding a tree, especially in the more arid regions of the Territory, was a challenge. The Eastern custom, made popular in Victorian America in the late nineteenth century, emphasized the traditional pine Christmas tree. In Oklahoma Territory, they had to substitute the pine tree for a native oak or blackjack tree. Young people of the communities gathered to decorate the tree. The challenge was to turn the scrub blackjack into a pine laden with snow. To accomplish this, children wrapped the tree limbs and twigs with cotton. One industrious father had saved the tin foil separating the layers of his tobacco so that his children could fashion ice cycles for the tree. After the tree had it’s traditional “wintry look”, they proceeded to decorate with popcorn string garland. Food was such an important part of Christmas celebrations that the preparation started with the harvest of summer fruits and vegetables, which were canned, preserved and pickled. Also prepared were fruitcakes and a huge supply of mincemeat pie filling, enough to make it through Thanksgiving and Christmas. A special treat for children was to watch their mother prepare Ambrosia for Santa. As one author explained, “Little Marguerite Mitchener watched as her mother peeled and sectioned the fragrant, juicy oranges. Next her father, Dr. Mitchener, would split open the big brown coconut so Mama could drain off the milk and grate the sweet white meat. After she mixed the orange segments and the coconut, she usually added canned pineapple and sometimes a spoonful or two of sugar. On Christmas Eve, they filled a beautiful cut glass bowl with the Ambrosia and set it out for Santa Claus.” For most children, the customary Santa snack was a dish of cookies and a glass of milk. But Marguerite’s family could afford the extra treat of Ambrosia; they lived in a big two-story house in Okmulgee, Oklahoma. Oklahoma is a mosaic of culturally diverse people, who for one reason or another, immigrated to one of the last frontiers in the American West. 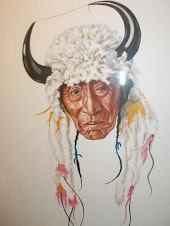 From Native Americans who were forced to move to Indian Territory, to homesteaders looking from economic enhancement from a new piece of land, to the town merchants and bankers who helped build the infrastructure of new communities, to the Eastern Europeans who found work in various trades and professions, Oklahoma promised opportunity. 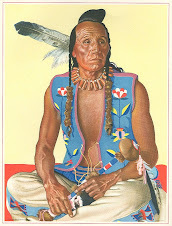 All who came brought with them rich traditions and added to the culture of Oklahoma.